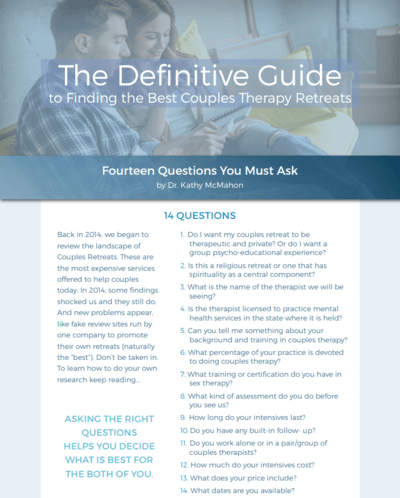 "Of the 80% of therapists that say they do couples therapy, 12% have not even taken a single course in it...."
Stop Aimlessly Surfing for Help. We've surveyed 300+ websites that advertise couples retreats and have put together a no-nonsense 6-page Definitive Guide to Couples Retreats. It'll help you select the perfect Marriage Retreat for you. Download our free report now and save time and aggravation. Copyright - Couples Therapy Inc.